Alderney, W 1 StP Türkenburg. Alderney, W 1 StP Türkenburg. Plan. 1 x R701 garage for Pak 40. 1 x Vf Pak casemate. 1 x 10.5cm K 331(f). 2 x 7.5cm Pak 40. 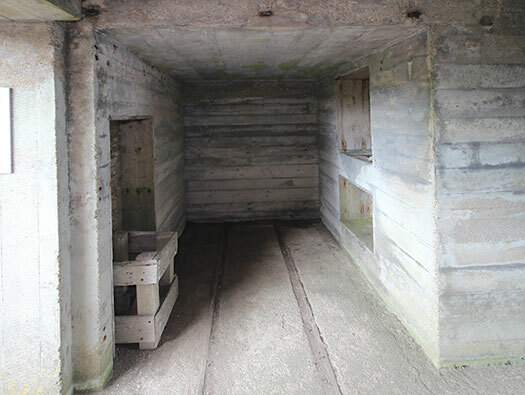 Jäger casemate for a 10.5cm K 331(f). R701 garage for Pak 40. 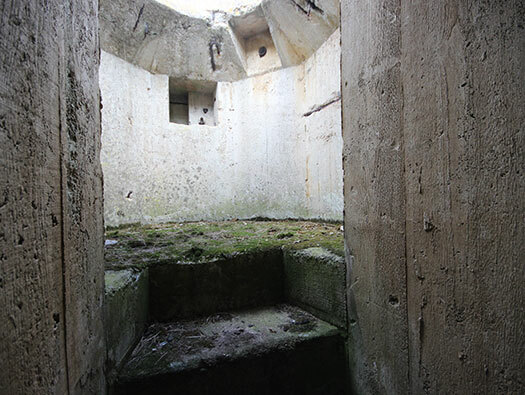 Jäger bunker, Vf casemate for a 75cm Pak, MG position and a 60cm searchlight. Alderney, W 1 StP Türkenburg. Road Block. Alderney, W 1 StP Türkenburg Road Block. Platte Saline road with one remaining concrete part to the road block, there would have been another on the left side. 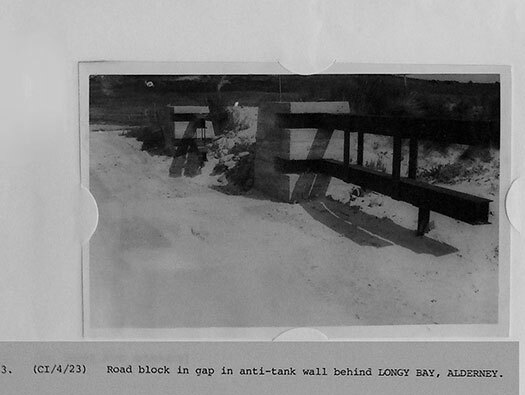 This is the road block at Longy Bay using two steel I beams that could swing across the road and block it. 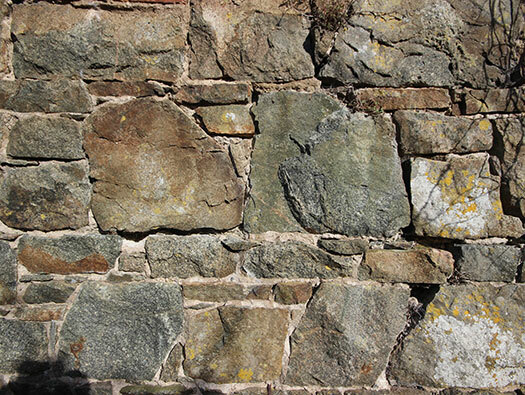 Close up picture of the concrete block. 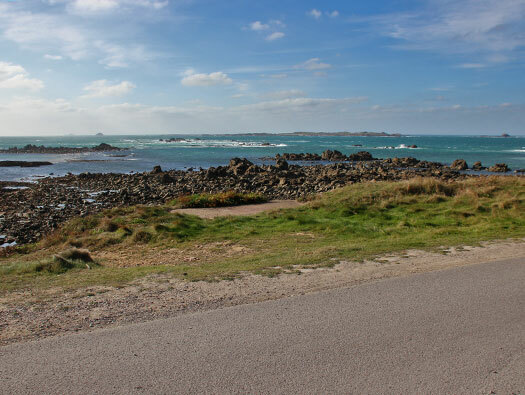 Alderney, W 1 StP Türkenburg. 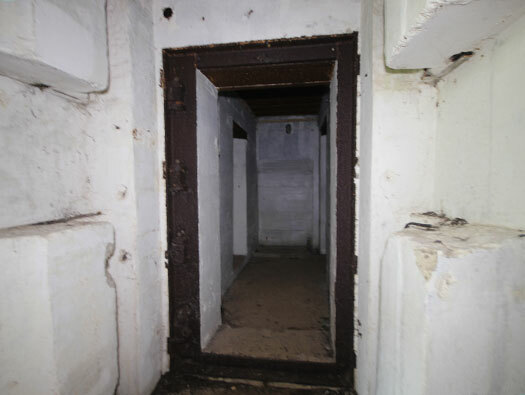 Jäger casemate. Jäger casemate for a 10.5cm K331(f) gun. A 'Jäger' bunker is named after its designer. 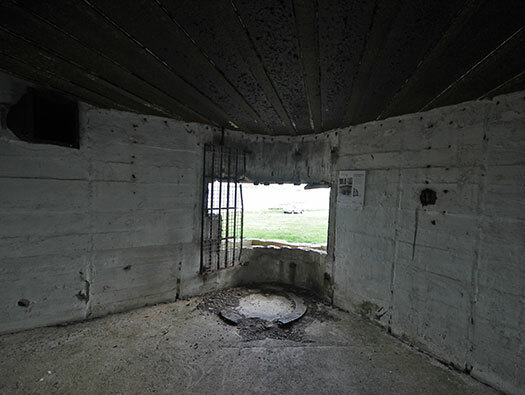 10.5cm K331(f) gun in an open emplacement. Alderney, W 1 StP Türkenburg. 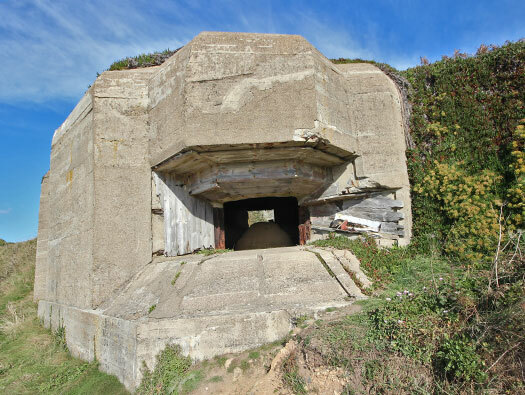 Vf anti-tank casemate. Vf anti-tank casemate for a 75cm Pak 40 gun. Alderney, W 1 StP Türkenburg. 60cm searchlight. 60cm searchlight position on the top. Alderney, W 1 StP Türkenburg. MG position. 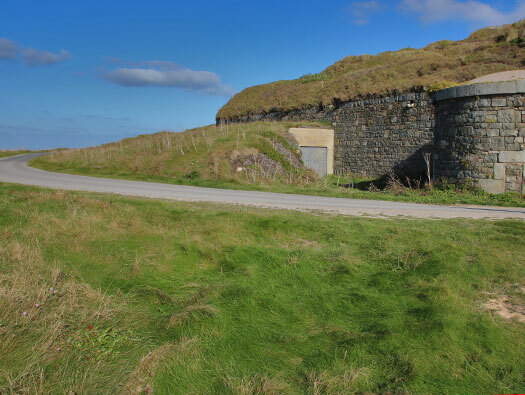 Victorian Caponier converted from musketry loopholes to two machine gun emplacements. 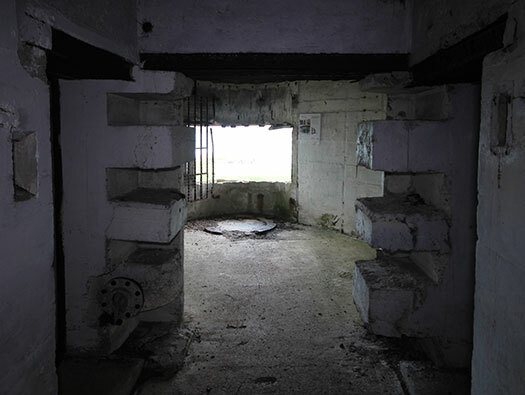 There were many machine gun positions all around the fort. Alderney, W 1 StP Türkenburg. 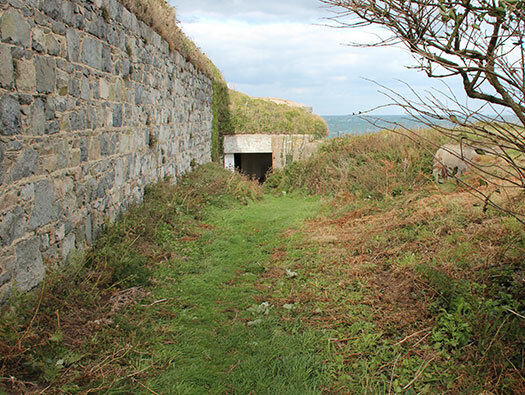 Search light casemate. 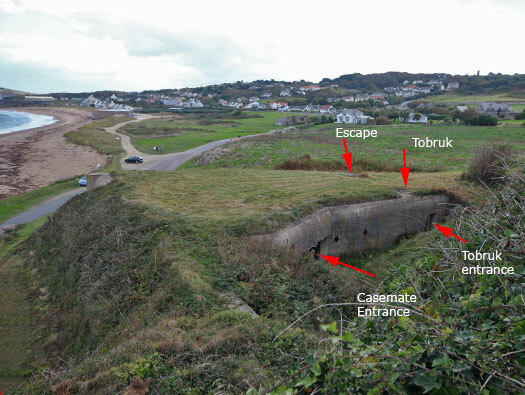 Search light casemate. A very strong position. Alderney, W 1 StP Türkenburg. Vf for a 75cm Pak 40 gun. 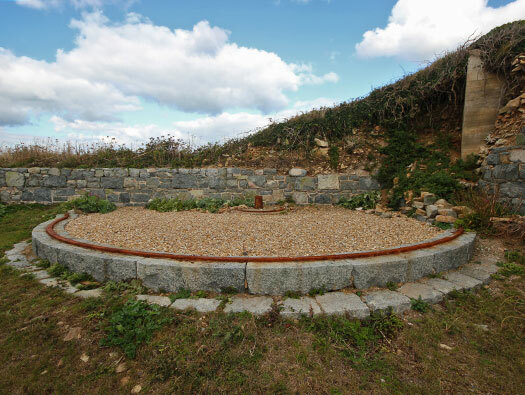 Vf for a 75cm Pak 40 gun room ready to shoot right down the beach. 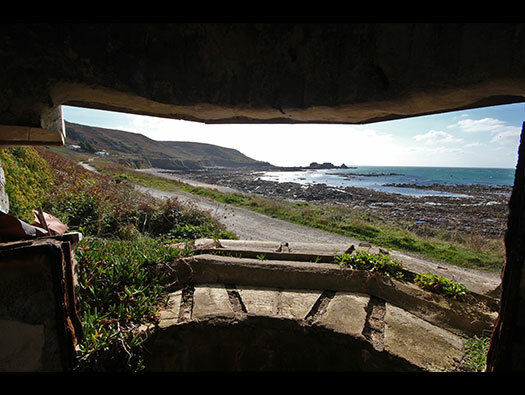 The view down the beach from this embrasure in 1945 taken by a British Offices..
Vf for a 75cm Pak 40 gun room and Vf MG position next to it. The half round shape on the floor is where a steel runner would have sat so that the guns rear legs would sit to stop the gun moving back on the recoil when fired. .
Rear legs of a 7.5cm Pak 40. Alderney, W 1 StP Türkenburg. Vf MG.
MG08 Maxim on its WW1 mount.. 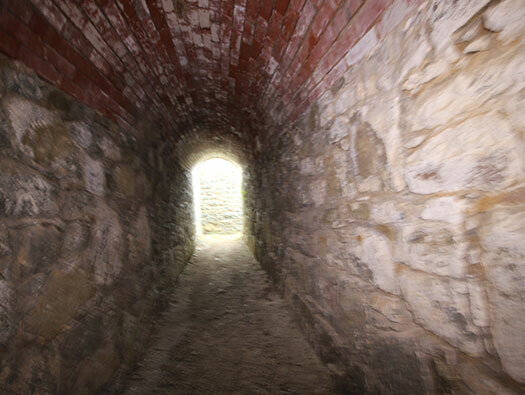 Passage way cut through the old forts wall. 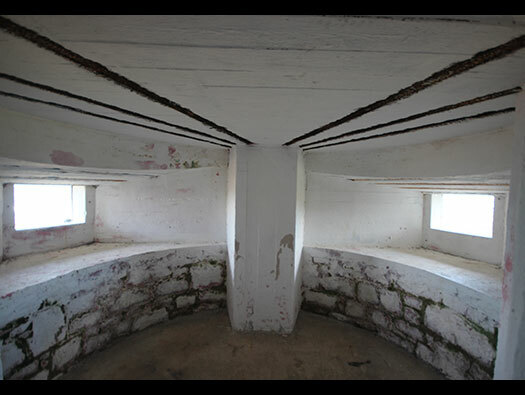 Musketry loopholes converted to concrete rifle emplacements. Alderney, W 1 StP Türkenburg. Double MG space. 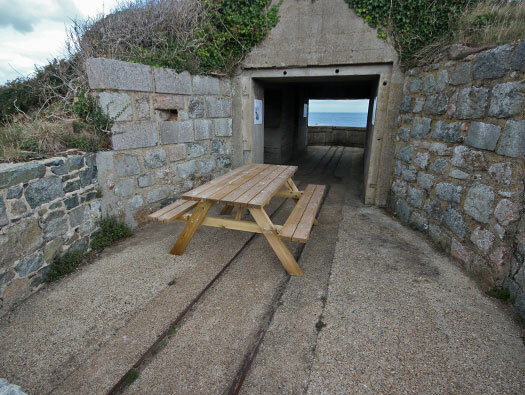 Converted Victorian Caponier converted to a twin machine gun position. Alderney, W 1 StP Türkenburg. Jäger bunker. Out behind the Jäger bunker. 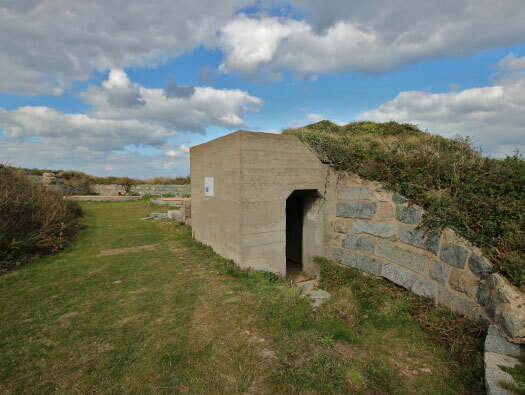 Alderney, W 1 StP Türkenburg Jäger bunker. 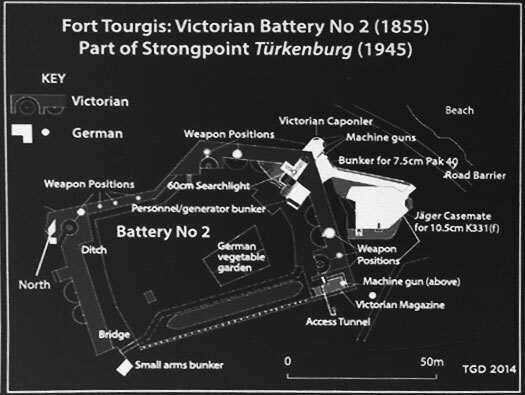 Plan of the Jäger bunker. 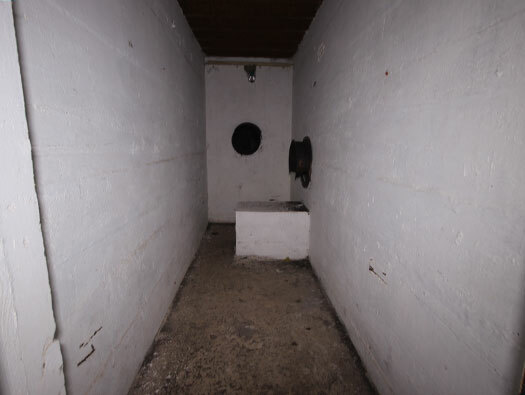 The whole rear of the bunker, left the large vent to vent out gasses from the gun room. 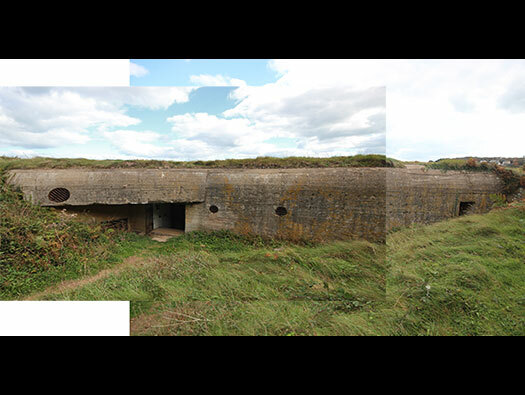 Next close combat defence, door entrance, two ventilation vents and the Tobruk defence entrance. 200mm vent. The two types on that wall. The largest possibly 300 to 400mm vent. Alderney, W 1 StP Türkenburg. 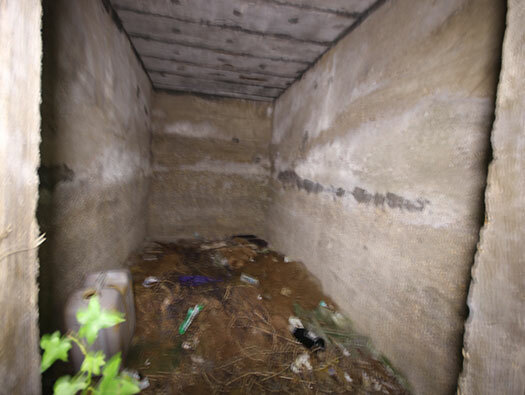 Jäger bunker Tobruk. The Tobruk defence. There would have been a steel slip ring for the machine gun to slide smoothly around. Tobruk just like this one. The gun sat on a slip ring that could travers 360°. 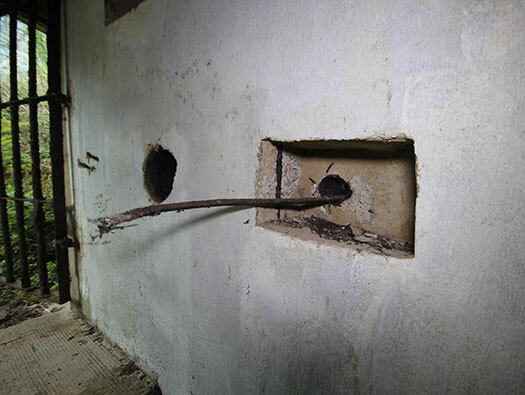 The round hole is the Sprachrohr mouthpiece would have been screwed in and by speaking through it, you could talk to the troops inside the bunker. The square shape on the left is another communications connection and could be attached to a field telephone to also speak to inside or a connection to the main telephone network. 'Sprachrohr' the words painted on the wall. Looking into the Tobruk from the steps. 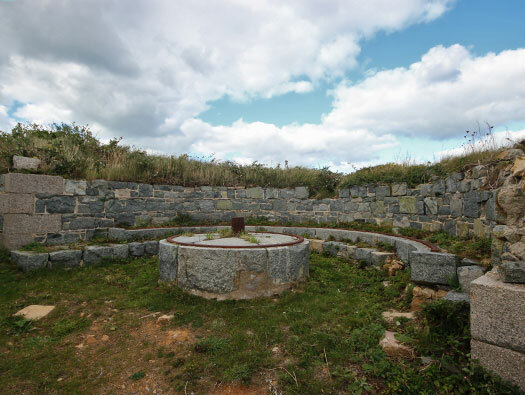 One thing I have noticed on Alderney and nowhere else on the Atlantikwall is the use of aerials mounted into Tobruks. It does not mean they were used but they could be. 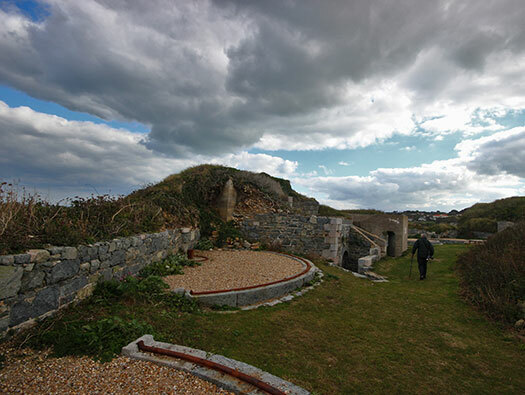 Alderney, W 1 StP Türkenburg. 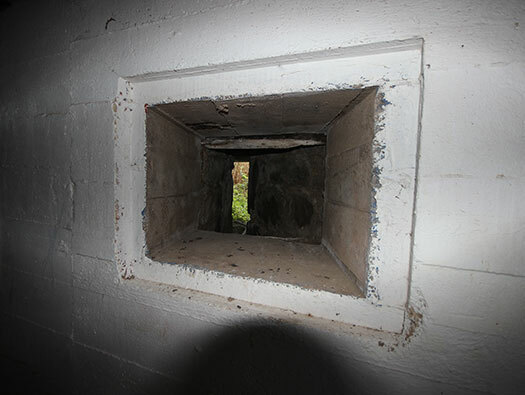 Jäger bunker Close combat defence embrasure. 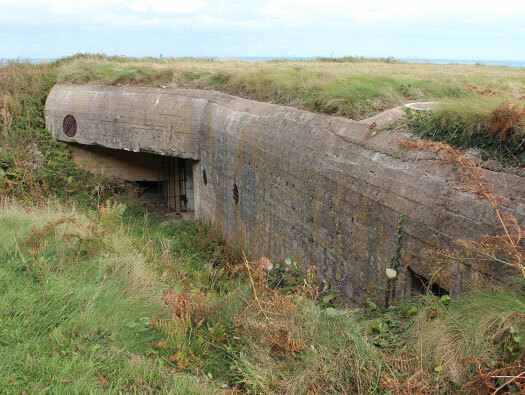 Close combat embrasure covering the rear door with a lethal MG34 a sub-machine gun or a rifle. What ever was at hand. Alderney, W 1 StP Türkenburg. 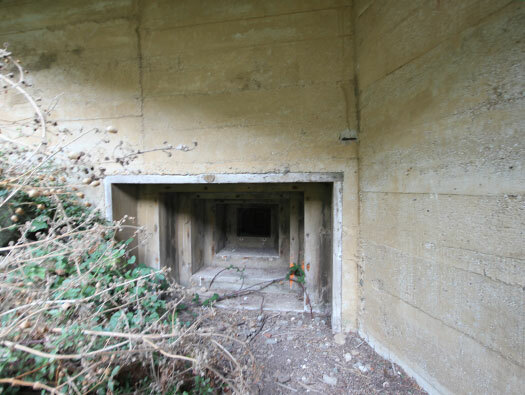 Jäger bunker entrance. 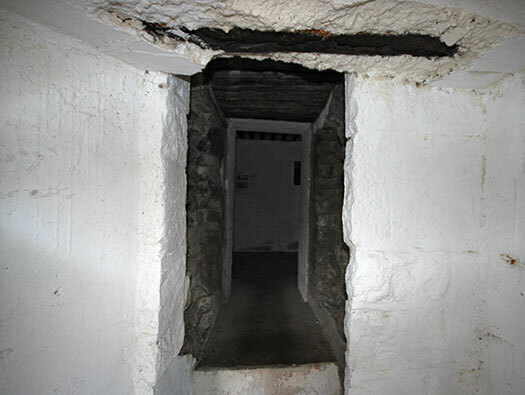 The entrance is much wider than later bunker types, so here there were two gates to fill the gap. 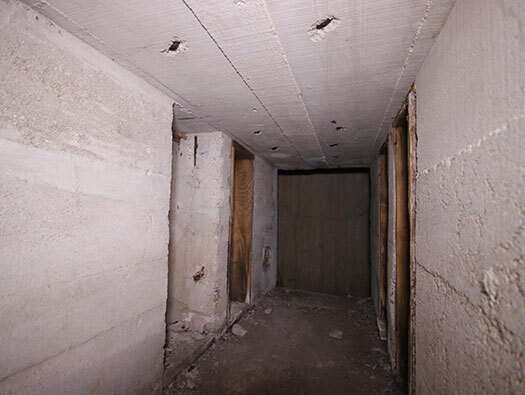 Inside the left niche is a relay box for a field telephone, this would contact the inside of the bunker from the entrance. 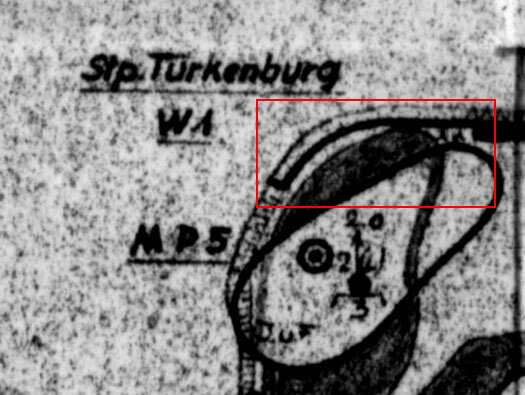 Alderney, W 1 StP Türkenburg. Jäger bunker gas lock. Two aerial slots either side of the door. A 434PO1stable type armoured door with its four heavy hinges. The two types of this door, left & right. 4ML01 equalising valve. When a close explosive goes off a pressure wave is forced into the bunker via its fresh air system. This equalising valve closes it off and stops the air pressure rise. 48P8 close combat defence embrasure fitted here. Plan close combat defence room. 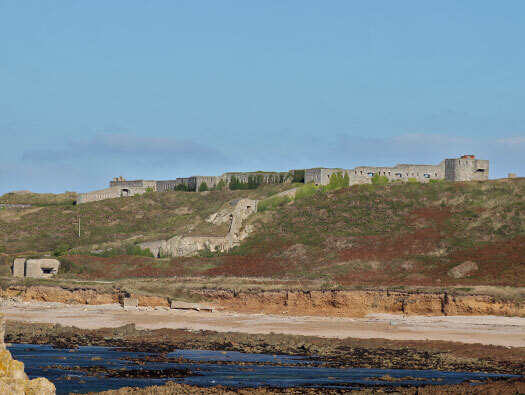 Alderney, W 1 StP Türkenburg. 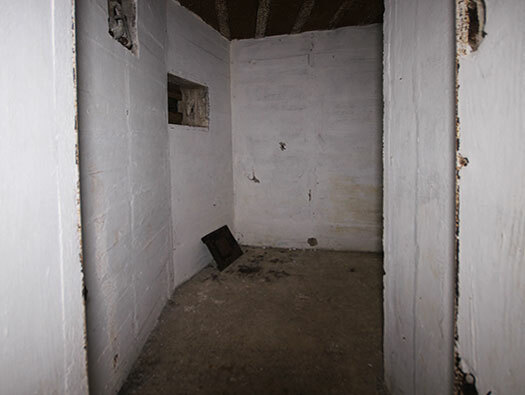 Jäger bunker Crew room. Crew room with door to the gas lock. Bunk beds hook in the roof. Fresh air pipe connection. Its rare to find the pipes in place and rarer to find a pipe connector. Fresh air pipe work in the crew room. Alderney, W 1 StP Türkenburg. 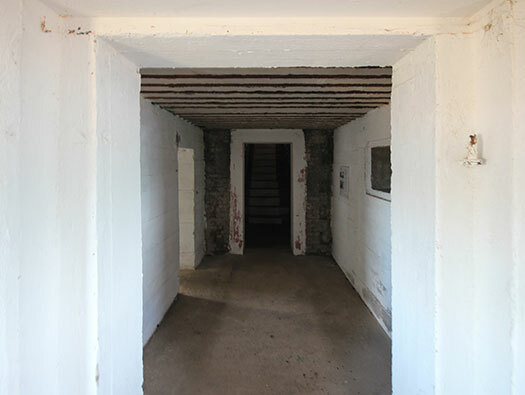 Jäger bunker Inner entrance. 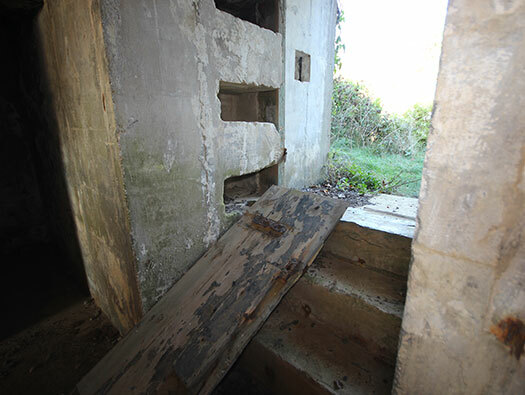 The tooth shaped pieces of concrete on either side was for a large steel double door and frame to protect the gun room. 484P2 is a door that may have been envisaged here but never fitted. Cleaning brushes hung on the wall of a bunker. Alderney, W 1 StP Türkenburg. 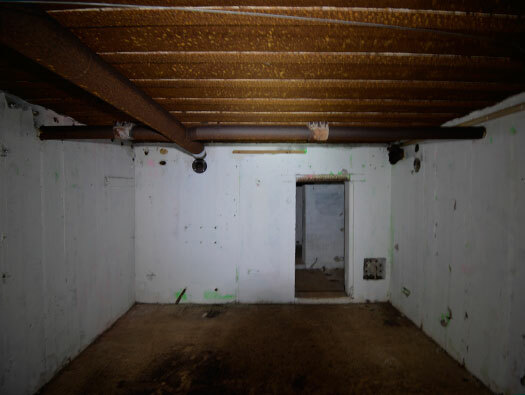 Jäger bunker empty shell case room. This is where the empty fired shell cases would have been stored and then removed to be re-used at a later time. Boxes shell cases came in. Alderney, W 1 StP Türkenburg. 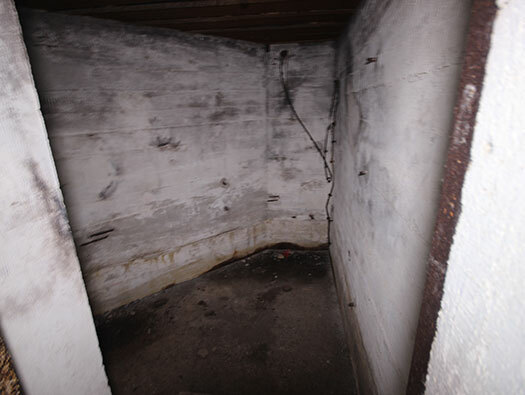 Jäger bunker ventilation room.. This is where a large ventilation fan and an electric motor would have sat on the concrete plinth. The gases when the gun fired would be sucked out by the fan and sent to the the large 300/400mm vent in the rear wall. The collecting vent in the gun room. Extractor in a different bunker. Looking into the extractor vent pipe. Alderney, W 1 StP Türkenburg. 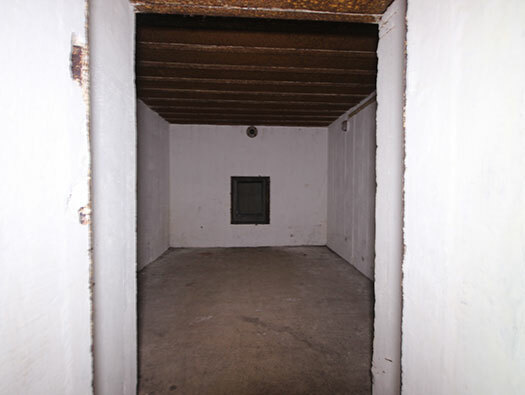 Jäger bunker gun room. Gun room with left to right the ventilation vent, the guns tie down ring. There was also a periscope fitting in the roof. 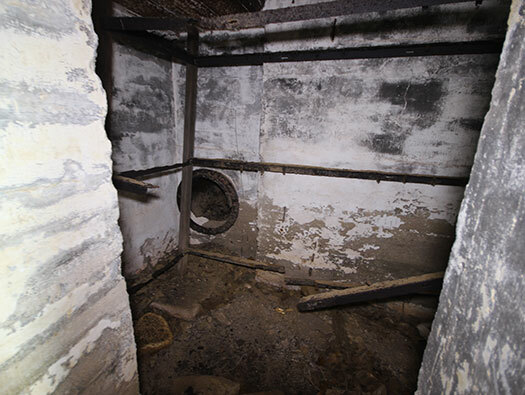 The collecting vent in the gun room top left hand corner. Base for the periscope in the floor on the left side. 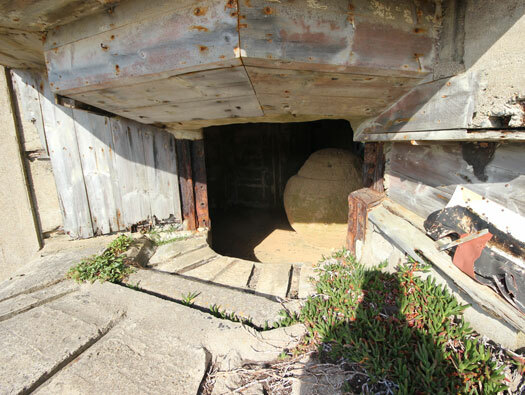 The tooth shaped pieces of concrete on either side was for a large steel double door and frame to protect the gun room not fitted. Alderney, W 1 StP Türkenburg. 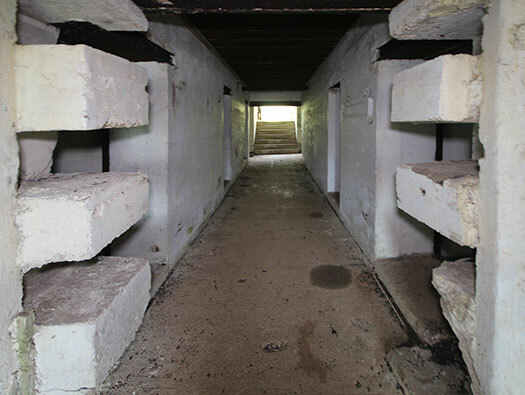 Jäger bunker Ammunition room. 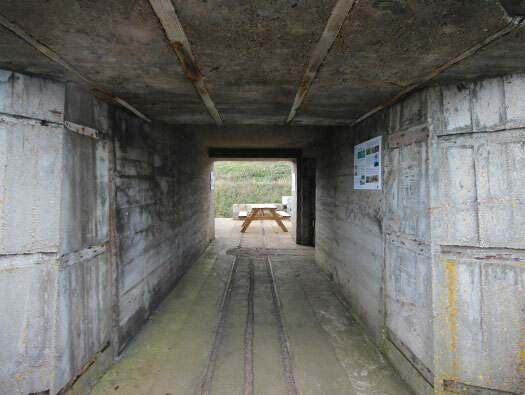 Ammunition room and the bunkers escape on the far wall. Ammunition would be stacked in racks with about three loads of shells. A load is the amount of shells calculated for firing for a certain time. Then when more is needed, the order would go out for how many loads were needed. Plan ammunition room and escape. 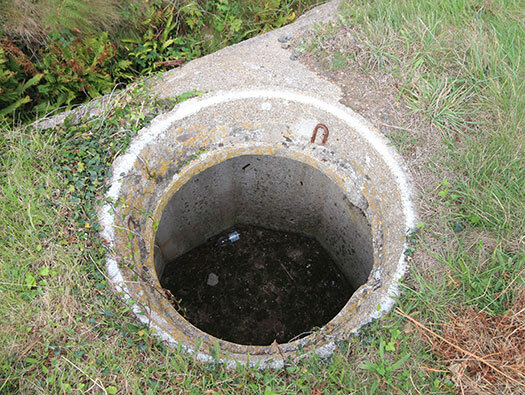 The escape man hole cover over the shaft going down to the bunkers ammunition room. Plan of how the escape worked. Alderney, W 1 StP Türkenburg. Jäger bunker escape tunnel. 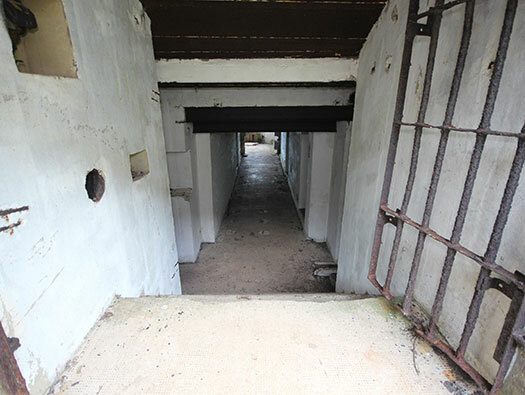 The escape tunnel shows the thickness of the bunker walls with slots in the sides for escape shutters, lengths of metal strips with a handle to shut off the space. 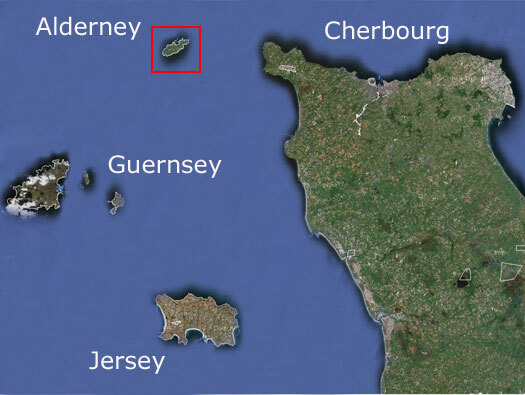 Alderney, W 1 StP Türkenburg. Jäger bunker connection box cable. DA nice brick and stone passage. 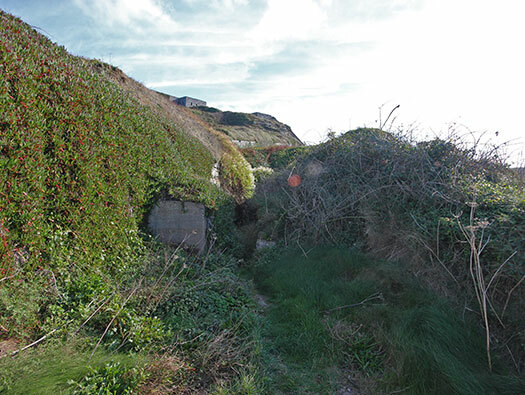 Alderney, W 1 StP Türkenburg Battery No2. One of the many 68 & 32 pounder gun mountings that were here..
32 Pounder gun in position and crew. 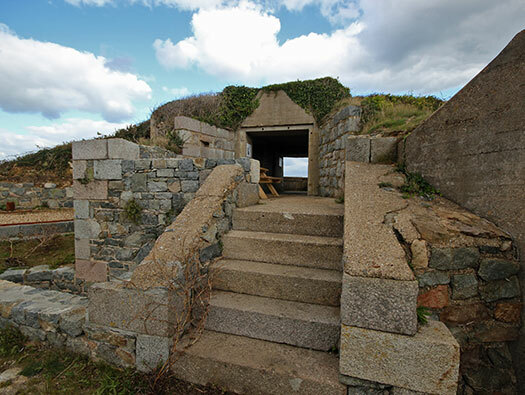 Alderney, W 1 StP Türkenburg two more 1855 guns and searchlight. 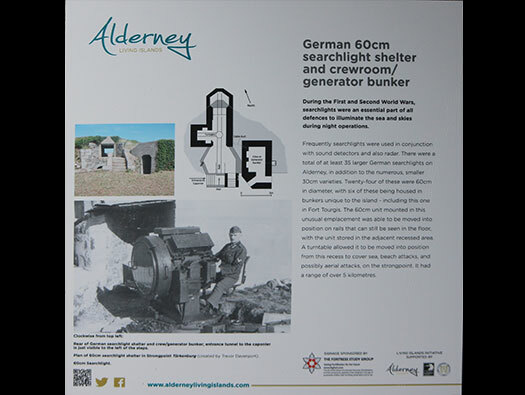 Alderney, W 1 StP Türkenburg searchlight. German concrete mixed with English Granite blocks. 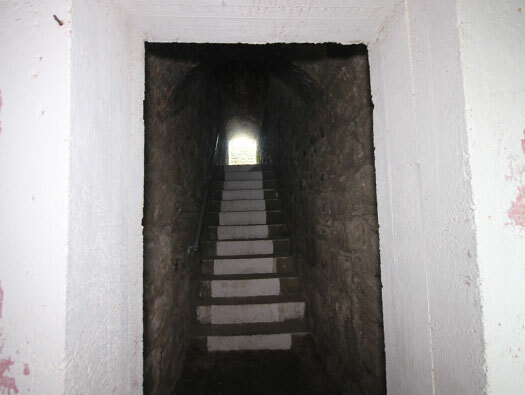 The searchlight ran on rails so that it could be pushed out hear to search the sky for aircraft, back into the tunnel for service, repair or storage. Or run out at the far end and used to show up targets for the artillery inland or the guns set around here. 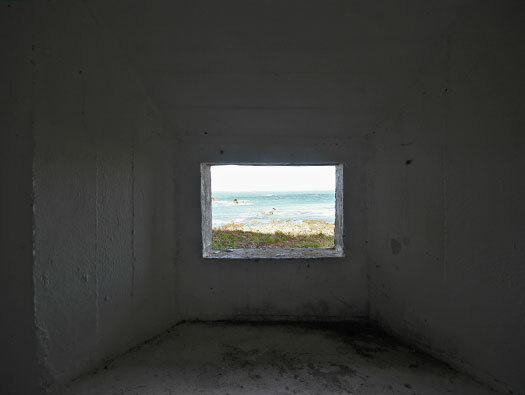 Looking out to the working end of the bunker. It says crew or generator bunker, if a generator was inside it would be noisy, smelly and dirty, I would think the crew were somewhere else. 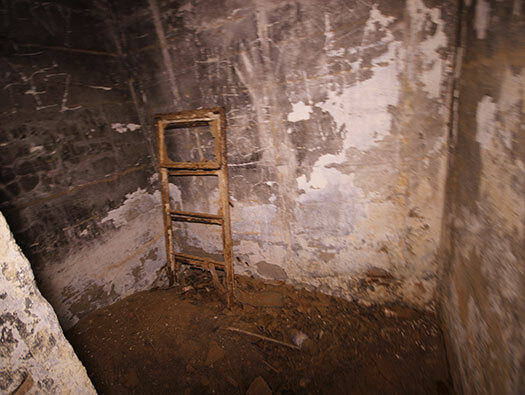 There was also a cable from this room to the main searchlight emplacement. Bunker/searchlight generator. Although it needed to be small, it also needed to be powerful to power the light. What the Allies called a Gerry can for the petrol. 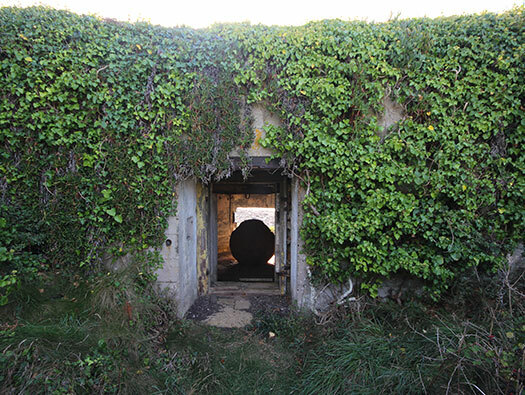 Searchlight generator bunker. 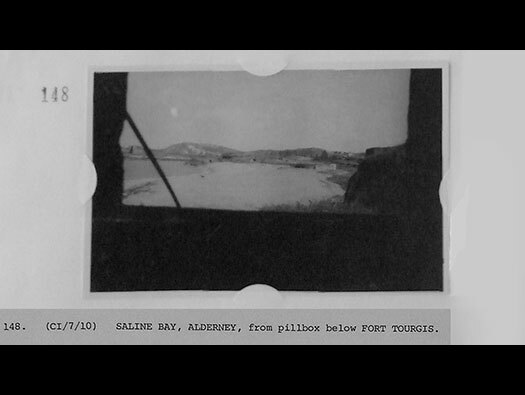 They would have had communications via the main field telephone system to the Flak HQ and the Artillery HQ to either send details of what they have seen or else to receive orders on where to search with their light. The lights could also be directed by sound and radar location. Just around the corner on the next bay is this garage for a 7.5cm Pak40 A/T gun. R701 garage for Pak 40. 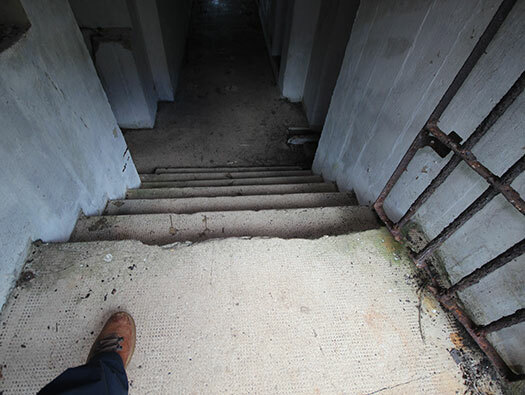 Just a long corridor for the gun to enter and there may have been some ammunition storage. In some garages it was under the floor. It lies next to another Victorian Caponier. The hard stand for the 7.5cm Pak40 A/T gun to be fired from. It would have had either concrete walls around the front and two sides or sand bags and or earth piled up. 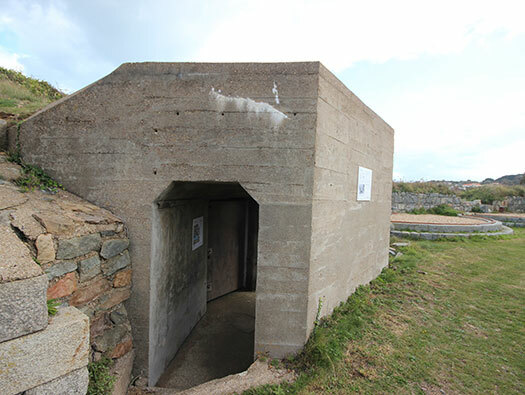 Alderney, W 1 StP Türkenburg R670 casemate for a 10.5cm K 331(f). R670 casemate for a 10.5cm K 331(f). R 670 casemate for a pivot gun with 90° angle of fire. 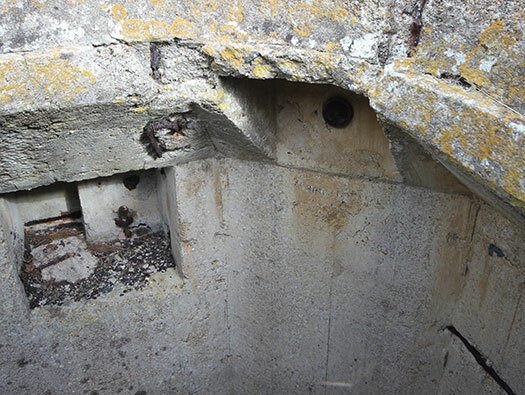 Looking into the gun embrasure. There is a lot of wood is still in place after all this time. I believe this is the way the gun and shield would have looked. Ammunition and ventilation. 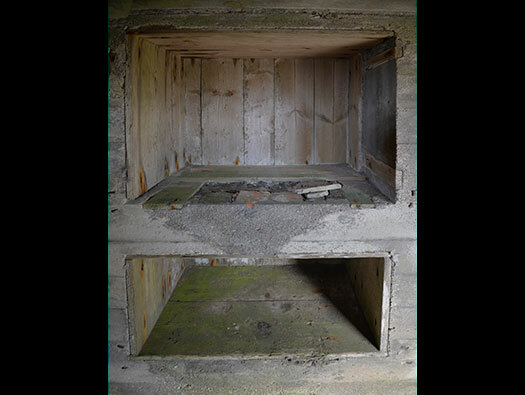 Very much the same as the Jäger casemate but this time the extraction was removed from slots in the roof structure and piped through the concrete to a fan and out via a 200mm vent in the rear. Ammunition, ostensibly the shell store. Cases stacked in wooden frames. 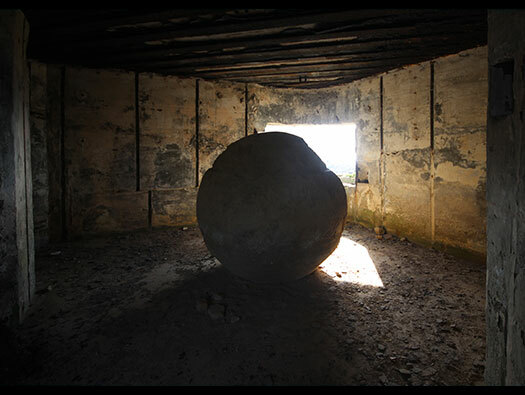 Ignore the sandy concrete ball, its ART you know. Still better than graffiti. The view across Clonque bay and Fort Clonque in the background. I believe this is the way the gun and shield would have looked inside the casemate. There should have been some rear doors or door fitted here but it looks like they were not sent over from France. Behind the gun is some extra ammunition storage. 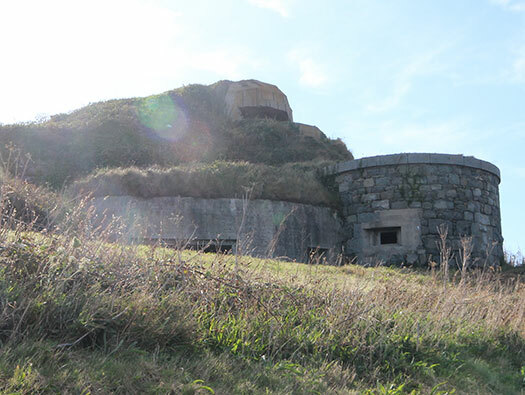 Fort Tourgis with the R670 pointing along the beach. 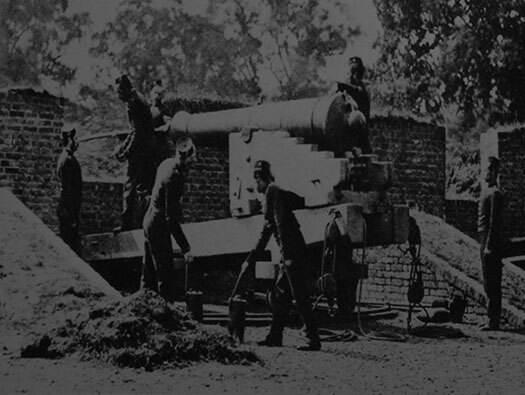 The fort with its three 2cm Flak guns and many M.G. 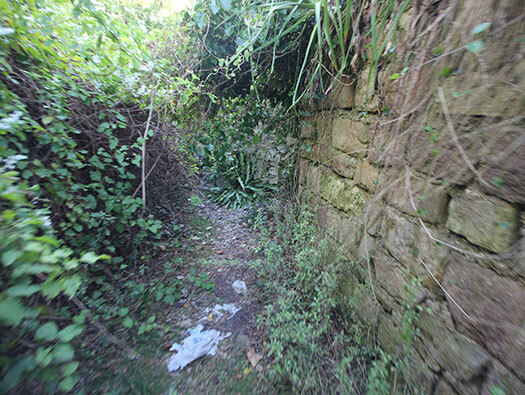 set into the Victorian defences. Gun loopholes and ports up the outer wall. About half way up a machine gun embrasure. 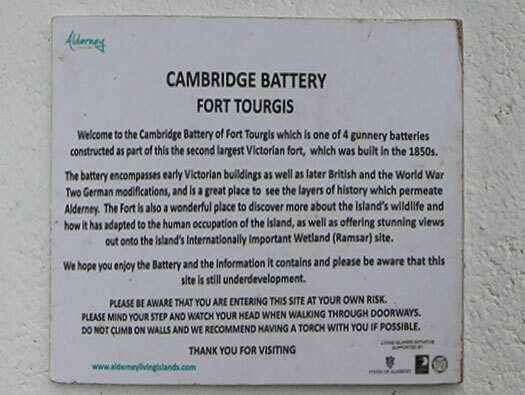 The wall of Fort Tourgis.